Illinois’ Future Energy Jobs Act (FEJA) will be the premier legislation to drive renewable energy and economic development in the state. Many communities, townships, school districts, colleges, and building owners are gearing up for this legislation. Along with energy efficiency improvements, this legislation calls for 1.3 GW of wind and 3 GW of solar by 2030. About 1500 MW of solar needs to be built by 2021 and of this approximately 670 MW is distributed generation. 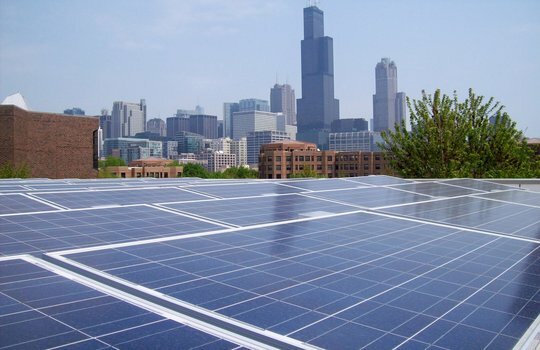 The Illinois Power Authority has issued a draft Renewable Energy Procurement Plan and the Illinois Commerce Commission is expected to approve it by next month. The intent of this article is to summarize the new “Adjustable Block Program” and “Solar for All” programs. For large scale (2+ MW wind and solar projects), procurement process has been set and will go through the normal bidding process and, therefore, will not be discussed here. In a market where energy prices are very cheap, the primary mechanism to incentivize these projects is via Renewable Energy Credits (REC’s). One REC is equivalent to 1 MWh. These credits will be set according to the “Adjustable Block Program” for community solar and behind the meter projects. Depending on the size of the project and the utility company whose territory the project lies in, the Illinois Power Authority will grant REC values to incentivize these projects. There are separate blocks for community solar and those for distributed generation, which consists of commercial and industrial and residential. On the community solar side, based on IPA’s draft procurement plan, these REC values may range from just above $100/REC to just under $50/REC. Similarly on the DG side, these REC values may range from close to $80/REC to $30/REC, depending on size and the block. IPA has issued the first three blocks and the REC values in these blocks will reduce over time. Hence it is important to get in early. These REC values will be paid at an accelerated level of 100% up front for residential solar and within four years for commercial and community solar projects. All these incentives along with the federal investment tax credit and accelerated depreciation are expected to defray the up upfront cost of doing solar. For community solar blocks, there are REC adders depending on the percentage of residents subscribing to the solar array. For example, a community solar project whose subscription consists of 75% or residential clients will earn higher REC values than those that subscribe to none or very little. On the net meter side, community solar will be net metered at whole sale electricity rates while commercial and residential will be compensated at retail electricity rates. Therefore, depending on the situation, commercial and industrial clients will benefit from “behind the meter” applications since they will earn retail rates for excess electricity sold back to the grid. Therefore, residents that cannot or do not want to put solar on their dwellings, they will benefit from subscribing to a community solar garden. The “Solar for All Program” is designed to give access to low income communities that have higher barriers of access to solar. The program has four main categories: low income distributed generation, low income community solar, non profits and public entities, and low income community solar pilot. The REC’s in the “Solar for All Program” are supposed to mirror those in the “Adjustable Block Program” except that they will have higher values for the REC’s. In addition, with the exception of the “low income community solar pilot” program, the pay-offs for the REC’s will be upfront rather than over four years, as in the “Adjustable Block Program”. These upfront pay-offs are to further incentivize low income communities to invest in solar by defraying these upfront costs. Overall, the program will boost solar for all communities, while enabling job creation and economic development. Companies that are early movers can reap the rewards of this opportunity while helping local communities in Illinois. This entry was posted in IPS Solar, Solar Industry on March 19, 2018 by Kyle Wehnes.